With ever increasing urbanization of humanity, the need to take advantage of the underground space at the same time as the air space has lead to a significant increase in tunneling work under major cities, around the world. Mass transit either for rail transport or automobiles provides major relief of surface congestions: the just completed Central Atery/3rd Harbor Tunnel Boston project is a good example of tunneling by cut and cover and drill and blast. Control of surface runoff water that needs to be treated before being released to the natural streams has created a considerable amount of tunneling work for C.S.O. projects. More population means larger sewers and extensive work is being performed to modernize our wastewater conveyance systems. Tunneling today can be traditional drill and blast or by tunneling boring machines but always highly mechanized. In soft ground tunneling, when NATM is not desirable or practical, different types of shielded machines are used. Earth Pressure Balance (EPB) machines use the restrained excavated materials to support the bore's face, Slurry Shield machines use liquid earth support to stabilize the face. Some machines are hybrids of the two systems. EPB machines eventually require soil conditioners to help in the control of the spoil extraction process. 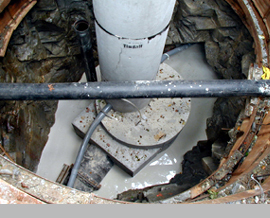 Slurry shields are more complex and require a comprehensive slurry management program, all spoils being removed by slurry lines to the surface through a solids separation plant and recirculation of the slurry whose characteristics must remain in tight control while being able to face unanticipated ground conditions. Tunnels that are lined, always require some form of contact grouting. Judicious grout selection can make this work much easier. Unlined tunnels that receive a service pipe of a smaller diameter which requires to fill the space in between, can be economically flooded with engineered self-hardening slurries that will set slowly without excessive heat, and form a permanent utility encasement of sufficient strength but nevertheless easily re-excavated if necessary in the future. Access shaft to tunnels call on a wide variety of construction techniques generally making use of a plurality of geofluids. Slurry walls, secant piles either drilled or auger cast, jet grout columns, deep soil mixed columns, steel sheet piles driven or placed in slurry, ground freezing. We have products that assist all these activities.